Here is the second part of the post concerning disasters and calamities. For the earlier points, please see part 1. I pray that the Lord will provide His knowledge to you all from Scripture concerning this important matter. The last point centers on the “why” question. Much more can be said concerning this topic, but time is limited at this moment. How can a good and loving God do this? If He is sovereign over disasters, then He is not loving and good. 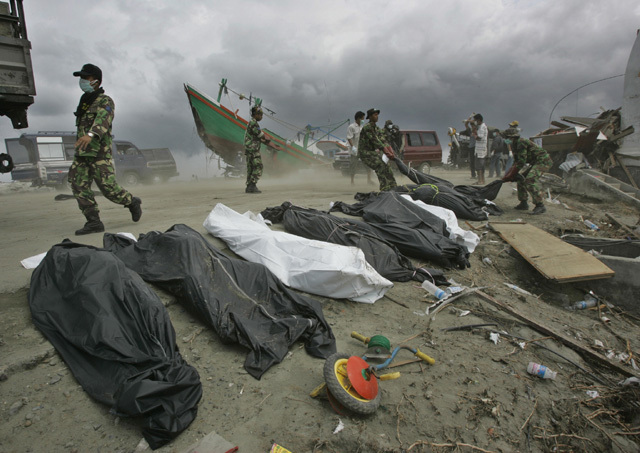 So many deaths occurred from the tsunami and the disaster. How can a loving God who claims to be sovereign, allow small children be wiped away from their mother’s arms? My only son, daughter, child has been taken away from me. The grief is unbearable. Why did God allow that to happen to me? Let’s turn to the Bible to answer this big Why question concerning man’s unbiblical perceptive concerning the function of God’s love and sovereignty. He sometimes uses nature to display or press upon man’s mind concerning His presence or judgment. So the Big WHY: If God is all-powerful and loving, why does He allow natural disasters? Many have provided wrong answers and have created a sentimental view of God rather that a view that is Scriptural. The sentimental view of God is quite problematic because it has caused many to believe that a loving God will not hurt anyone. This is what happens when one does not have scriptural view of God. Sentimental view: A loving God does not give pain, suffering, or causes disasters. Many Jews who came out of the holocaust, killing fields, and other atrocities, could not believe in a good God because to some of them, a good God cannot allow suffering, pain, disasters, etc. Idolatry is in the making when a sentimental view of God is the substitute for the biblical view concerning who God is and how He functions. I am addressing love, which is one of the attributes of God because it is one of the most abused and maligned attributes by the world, professing Christians, and even some sincere Christians. The Bible is not imbalance whereby its sole focus is on the love of God. In fact, both OT and NT were careful in terms of how the love of God is defined, used, and illustrated. So careful that they used different words for love. Eros (sexual, lust), Phileo (brotherly love), Agape (very few understood this; God-like type of love; i.e. the good Samaritan). Only believers can truly understand and accept the salvific love of God. I am not saying that the love of God can’t be mentioned in public, but one must use the notion of love wisely in accordance to Scripture. The one thing that the Bible does not teach is salvific love for everyone. If that is true then there would be no Hell, hate, wrath, or justice of God (cf. Psalm 5:5; Psalm 11:5; Proverbs 6:16-19). But there is a Hell. The Bible never merely says, God hates the sin, but loves the sinner. That seems like a unbiblical cliche that is never expounded. He not only loves, but He also hates. On another note, we must be careful to not be cold-hearted in our evangelism because there are a few verses concerning hate. We must love our enemies (Matthew 5:43-45, “You have heard that it was said, ‘You shall love your neighbor and hate your enemy.’44 But I say to you, Love your enemies and pray for those who persecute you, 45 so that you may be sons of your Father who is in heaven. For he makes his sun rise on the evil and on the good, and sends rain on the just and on the unjust.”) My attention is not to expound on the topic of God’s hate. Perhaps in the future, we can tackle it. At any rate, one thing to keep in mind for now is that we must be nuanced and loving when explaining God’s love and hate (cf. John 3:16; 1 John 4:10). We must make the Gospel call to sinners. A loving God does not operate apart from sovereign control. This is important to note, because some will say, “I believe in God, but the supernatural had nothing to do with this because He is a loving God.” It is a result of sin. Question: But what does Scripture say? Recap: God’s character (Love [Psalm 100:5; Psalm 145:9], hate [Psalm 7:11; Psalm 5:5; Psalm 7:12]) + Sovereignty (Dan. 4:35). SO HOW DO WE ANSWER THIS BIG WHY? Each person, whether young or old deserve to die because we are all sinners. So when God sends disasters, no one can accuse Him of wrong because everyone deserves to die because of the Fall. Earthquakes, fires, other disasters are an illustration of the earth being subjected to futility. The same goes for sickness and diseases. The earth is stained by sin. Although disasters and diseases are an expression concerning God’s rightful judgment on a sinful and fallen world, it does not mean that God is specifically punishing a specific group of people for specific sins. Wicked people and righteous people died in many disaster and calamities together. SUMMARY: We can say that God revealed His judgment on unbelievers in those calamities, but He also displayed His goodness upon believers (brought them their eternal home) during those calamities (for believers, please see Romans 8:28). God never promised that life would be a walk in the park. The calamity is also a wake up call for unbelievers who are alive and a wake up call for Christians to be busy with His work on this earth, to test Christians’ faith in Him, etc. Romans 11:33, 36 (PLEASE TURN THERE). Everything happens for God’s purpose and glory. God is wise in terms of how He chooses to orchestrate His will. We can’t explain every disaster with exact reasons for every situation, but we could use those calamities to glorify Him (1 Corinthians 10:31). Even in the most darkest and difficult times in life, God never tells us to cease glorifying Him. Summary of foundational points for review. God is completely sovereign over disasters and calamities. God is good and loving even in disasters. God is righteous in all He does. He is holy. Disasters and calamities display both God’s judgment and His mercy in a sin-stained world. Ultimately, God does all things for His glory—to display His greatness and worth (Romans 11:33, 36). All Scripture is quoted from The Holy Bible: English Standard Version (Wheaton: Standard Bible Society, 2001), unless otherwise noted. Thanks EvangelZ. The study is a blessing! Thank you. I appreciate that you dealt with the sentimental view & also noted that we can’t necessarily tie event X to some specific judgment of person Y. I have seen both of those errors too many times to count. Well done. Your welcome. I agree concerning the errors often explained about this topic.